Along Adair Street in Cornelius, where TriMet riders once stood at a bus stop pole between the roadway and a drainage ditch, now they enjoy a wide sidewalk, bench and lights. Federal and city funds paid for the improvements along Adair. 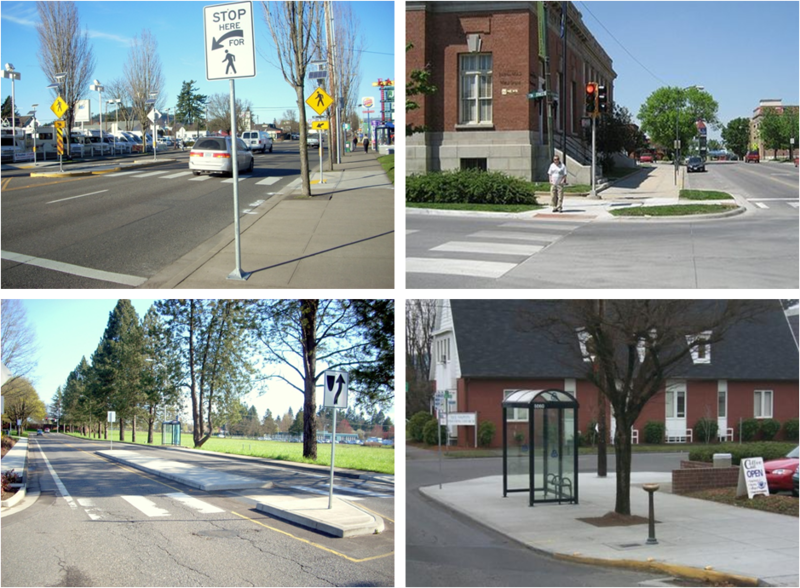 Wide sidewalks, crosswalks, rapid flash beacons and medians all improve safety for pedestrians and provide vital access to transit stops. Amenities such as shelters, landing pads and curb extensions make a much better experience for riders once they get to those stops. A partnership between TriMet and our jurisdictional partners will be bringing such improvements to three key corridors in the TriMet service district. 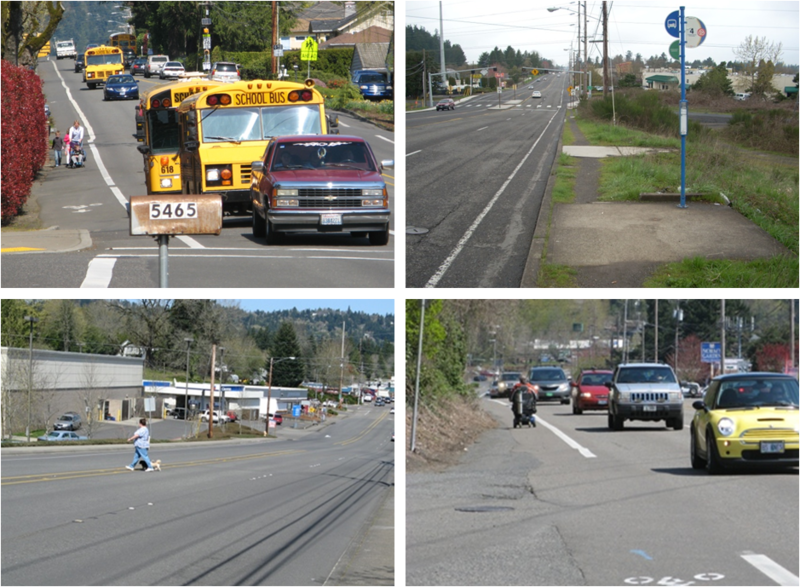 The Corridor Safety & Access to Transit projects were awarded funding in fall 2014 through the Oregon Department of Transportation’s competitive Statewide Transportation Improvement Program’s (STIP) Enhance funding process. ODOT will provide the majority of the $6.5 million necessary for the improvements using flexible federal funds, with TriMet and our city and county partners contributing about 10 percent in matching funds. The Powell Blvd – Division St (Powell-Division) corridor is currently served by TriMet Frequent Service bus lines 4 and 9, has numerous transfer points for crossing bus routes, and will include a high capacity bus rapid transit service in the future. The corridor was highlighted in the Pedestrian Network Analysis as a good prospect for partnership driven improvements. Ridership in the corridor averages 71,000 rides per week. 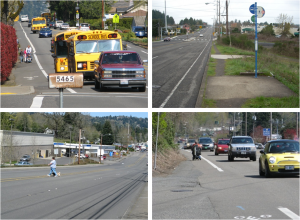 There are stretches of roadway without marked crossings, missing sidewalks and inaccessible bus stops. 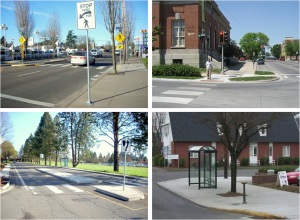 The Powell-Division Corridor Safety & Access to Transit project focuses on making crossings safer, including adding rapid flashing beacons where appropriate and supported by existing plans and project partners, while also improving bus stop shelters and lighting. This project will be directly coordinated with the Powell-Division Transit and Development Project, which will bring a form of bus rapid transit to the corridor in 2020. The Barbur-Highway 99W corridor has 4 to 6 travel lanes with a maximum posted speed of 45 mph. TriMet bus lines 12, 64, 93 and 94 serve the corridor with more than 35,000 weekly rides. Sidewalk and basic bus stop amenities are lacking on much of the corridor. Because of high speeds, crossing to a bus stop can be dangerous. Traffic congestion will only increase as employment and housing in the area grow. The Barbur-99W Corridor Safety & Access to Transit project will upgrade bus stops with landing pads and shelters where appropriate, construct sidewalks that connect to stops, enhance nearby crossings, install signal priority and improve transit operations on and connecting to Barbur-Highway 99W between Portland and Sherwood. This project is expected to be complete by the end of 2017. In the project area, Highway 8 has 5 to 7 lanes and runs through downtown Beaverton and low-income parts of Aloha, Reedville and Hillsboro. The future South Hillsboro development will bring more than 10,000 new homes and a new town center to the corridor. The maximum posted speed is 45 mph. TriMet’s lines 57 and 58 serve the project area with an average of more than 10,000 weekly rides. Sidewalk and basic bus stop amenities are lacking on much of the highway, particularly on the south side due to a railroad right of way. Because of high speeds, crossing to a bus stop can be dangerous. The Highway 8 Corridor Safety & Access to Transit project will put in bus stop landing pads and shelters where appropriate, construct sidewalks and connections to stops, install rapid flash beacons at nearby non-signalized crossings and provide other safety crossing improvements. Signal priority and other transit operational treatments at key intersections will go in along Highway 8 between 110th and 209th avenues. This project is expected to be complete by the end of 2017.